In almost every endeavor, there is a desire to move up in the ranks. Workers seek to be administrators, Scouting has its Eagle Scouts and the military has promotions throughout its ranks. 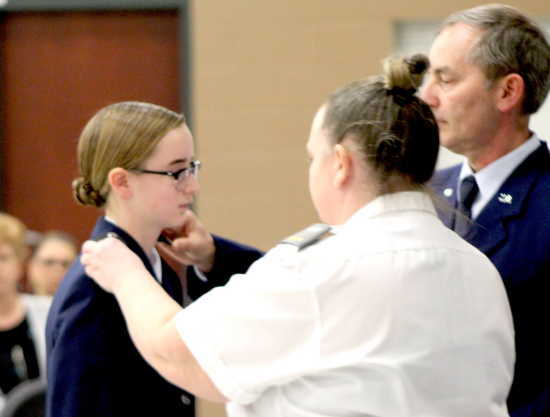 Payton Merrick understands the pride of promotion herself, as she became an officer in the Civil Air Patrol Paducah Composite Squadron on Monday, becoming a cadet second lieutenant in a ceremony held at the Armed Forces Readiness Center in West Paducah. Those being promoted to officer in the Civil Air Patrol earn the Billy Mitchell Award. Mitchell was a staunch advocate of the use of airplanes in the military after World War I, to the point of insubordination after meeting with skeptical resistance. He retired as a brigadier general in the U.S. Army Air Service. Those earning the Billy Mitchell Award are eligible to attend Cadet Officer School and the Civic Leadership Academy. If they choose to enlist in the Air Force, they may enter as an airman first class (E-3). The award is also advantageous to entering the Air Force Academy at Colorado Springs, Colorado. “(Merrick) shows a lot of leadership; she’s kind of a johnny-on-the-spot in terms of progressing through the ranks, being on time or ahead of schedule,” Hines said. “She’s full of enthusiasm, full of energy – an excellent executioner of her duties. She’s helpful to others. Merrick, a two-year cadet, is in the eighth grade at Kelly Middle School in Benton, Missouri, an hour’s drive to the Armed Forces Readiness Center. “I feel like the squadron here gives me a better chance at things I want to achieve in my life,” she said. “I would like to attend the Air Force Academy in Colorado for college. That would be a great goal for me and open a lot of doors. I would also love to be a pilot. Merrick also earned the Daughters of the American Revolution Outstanding Cadet Medal, presented by Kathy Toy, the regent and First District director of the Kentucky Society of the Daughters of the American Revolution. Civil Air Patrol cadets range in age from 12 to 21 and meet at 6 p.m. every Monday at the Armed Forces Readiness Center. Hines invited those who might be interested in joining to attend the meetings and see if it is something that they would want to be part of.